Recently, I had made an extremely difficult decision to leave a well paid employed salon job and pursue my love for hairdressing solo. Why you ask? Because the salon environment no longer made me happy. I used to be one of these people that believed that as long as i was getting paid well, I could tolerate just about anything. That is until i looked back and thought when was the last time I had the energy to go out after a week of 11 hour shifts. When was the last time i sat down with friends and family and actually asked how they are doing? The theory of tolerating everything lasted 4 years...and then i cracked. I must say this journey has made me realise the importance of happiness. Not only am I happier within myself, but people around me are happier. CHANGE IS GREAT. Originally my plan was to take a few months out and try something completely different to hairdressing. However, after one week i knew this was the wrong choice and instantly got back into it. As many stylists will know, you build up friendships with your clients and you support each other through tough times. Many of my clients have stuck by me and I am overwhelmed with how people have been with me since my decision to leave the salon. So I bought all my stock, and cracked on. I love my job. But most importantly I'm happy. This is a picture a client and friend bought for me to hang next to my hairdressing station.. I'm afraid this is not going to be the most interesting post as unfortunately I completely forgot to get a before picture! In the end it wasn't a HUGE transformation but a big freshen up. I will try an explain the before situation as best I can. The root growth was about 2 inches and was around a base 9. 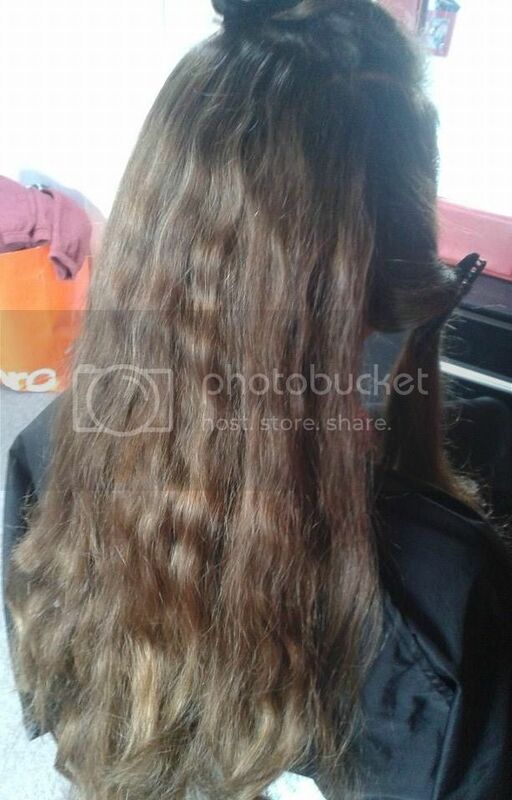 The mid-lengths to the ends were a faded dark red/nearly orange colour. She wanted it a lot fresher red without the orange. I chose the kadus 8/46 which is a blonde red violet and a gorgeous rich red. I chose the violet tone over the pure red as i feel the intense reds have a strong orange tone to them which is not what the client, or me wanted! As the roots were so different to the ends I mixed 30ml 8/46 with 15ml 7/0 with 6% for the root colour. Otherwise you would get HUGE root glow. The midlengths and ends I just put the 8/46 with 6% on its own. Here are the results. I am so sorry for the flash aswell but I can assure you it was an even colour! Let's just class this post as a picture fail. Ha Ha. We also took about 3 inches off the length to get a lovely blunt cut to enhance the condition, making the colour look lovely and shiny. Been a mobile hairdresser I don't always have the time to have my own hair done. 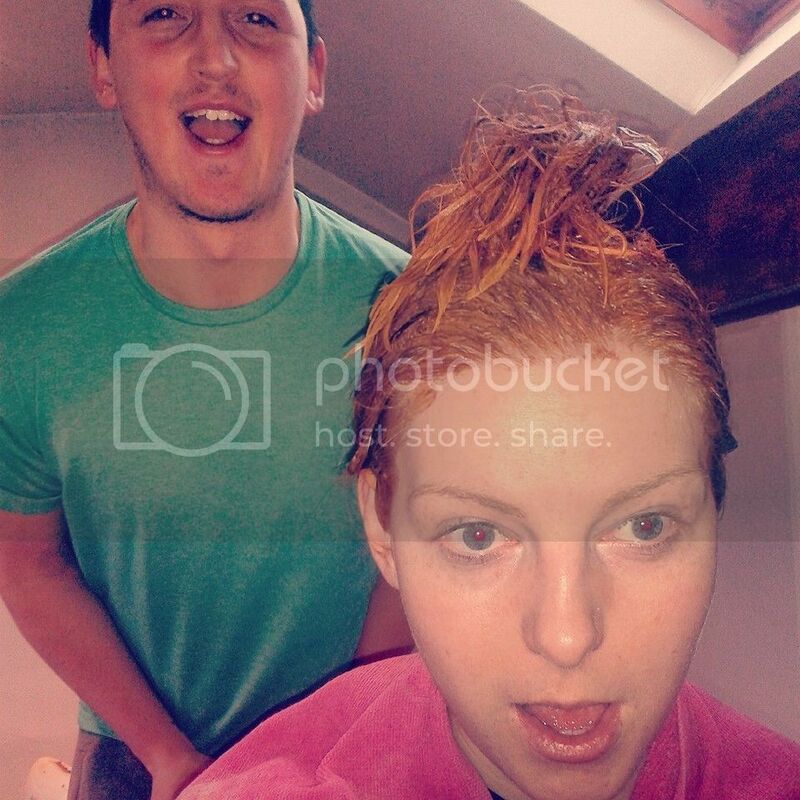 So I got Aaron to put some dye on my hair! Haha it has come out a little bit patchy but never the less it isn't TOO bad. We used Kadus 8/43 all over with 6% and I love the vibrancy of it! Here are a few clips of me having it done and the after! Becoming more and more of a fan of Kadus as time goes on! What do you guys think of the colour?! 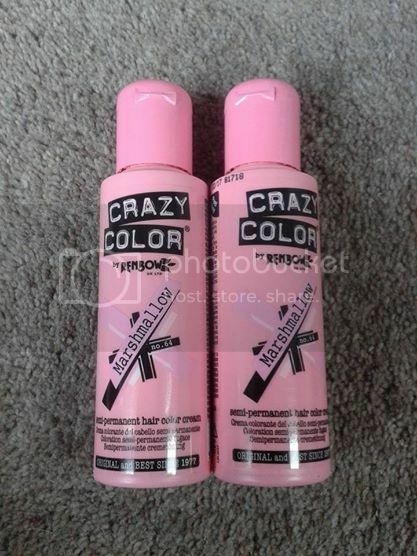 We first bought the Crazy Colour brand in shade marshmallow and although it looks gorgeous in the bottle it got a major thumbs down for effect as it did more or less nothing (this is after bleaching the hair too) So although disappointed I did however have a plan B. 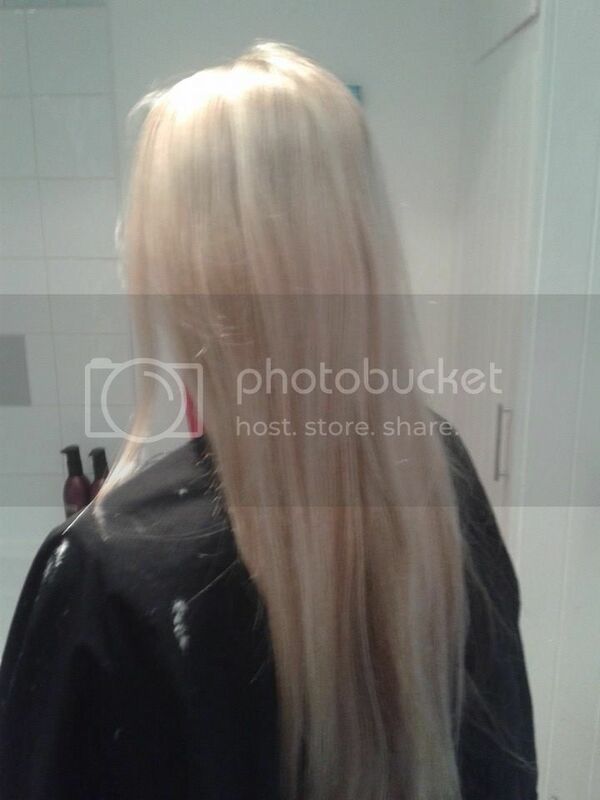 Although she is very blonde it was quite dark in the bottom section and even though it doesn't pick up great on this camera it also is very yellow. I went ahead and did a bleach shampoo to lift it a little bit. I didn't want the bleach on the head for very long. So I used the Loreal dialight in 9.11 (intense ash tone) to counteract all the yellow. I know as my friend likes to be a bit different she would be happy for it to be quite ash (some clients may not like this so be careful). I was really impressed with this toner. Then I melted it into the directions colour Violet on the midlengths and ends. Love it!! really happy with how it turned out. In hairdressing things don't always go the way you want, and you have to adapt to make the best out of the situation. As it turns out, we were both very happy the original colour didn't take well! 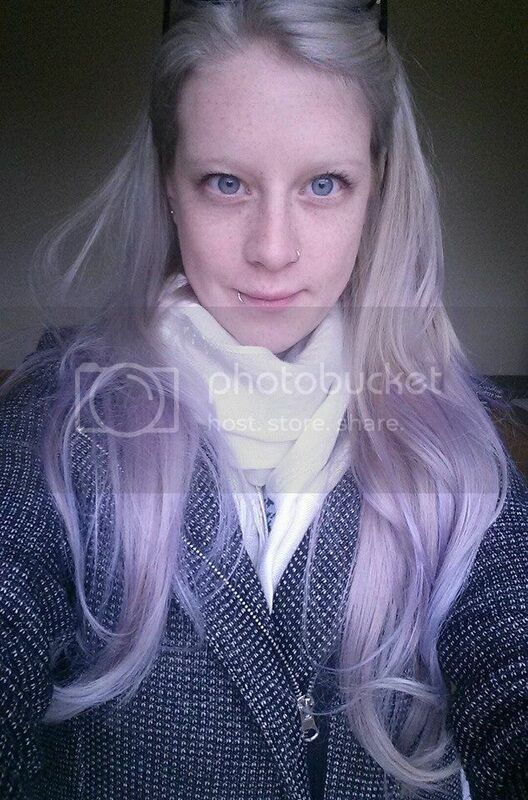 As now she has this lovely Ice Princess look and the violet is gorgeous! Very happy! Update -- she says the violet did not last for more than one wash?! What fashion colours do people recommend? Ahh the fun of having a best friend who loves to try out funky colours! The not so fun side is trying to find a colour that sticks to her hair haha. I have not known any hair like it before. 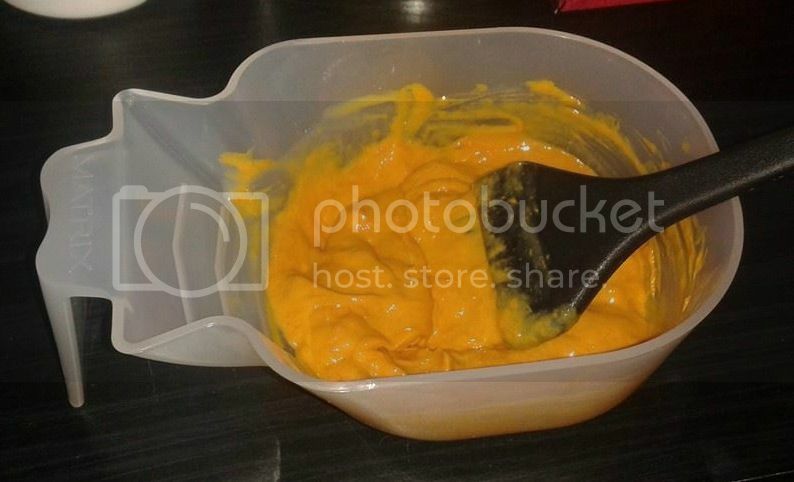 You put any colour on from any brand and it NEVER sticks. It might last until she next washes it, but after that it's as if i'd not done a colour in the first place! She is already blonde, but for the sake of getting the fashion colour to work they recommend bleaching it so that's what I did...I used the crazy colour brand in marshmallow. Which is a nice silvery pink (or should be). After we put the colour on I left it on for the maximum time and once rinsed we saw absolutely no difference whatsoever?! As I didn't want her to leave with nothing we then went on to put directions -- violet on the ends for a purple ombre effect. It did take, but she texted me to say it's non existent after she washed it once. Anyone have these problems?! I am aware fashion colours do not last very long but this is rediculous?! What are peoples favourite fashion colour brands that stock in the UK? So I have done a lot of ombres over the last few years but what seems to be getting more popular now is the balayage technique. This is a freehand sweeping effect to create a soft,gradual change from dark roots to lighter ends. 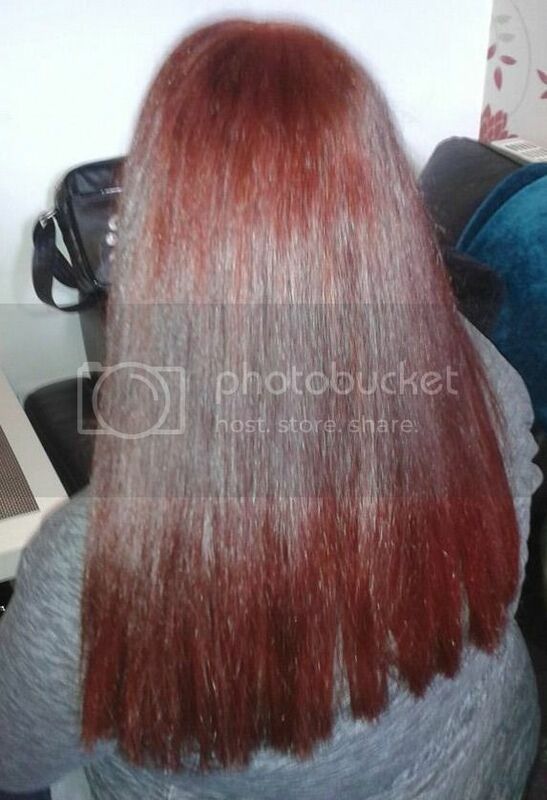 My client said her hair had been dyed too dark..(not by me i may add!) she wanted it a bit lighter but without having to worry about roots. If you lighten the ends and do a few face framing highlights it can make the base shade look a lot lighter anyway so as I didn't want to damage the hair from the roots I left the base shade alone. She also wanted to make sure the ends were not too light and did not want a huge contrast between the top the the bottom. This is the before picture. Highlights showing through the hair and the ends have fades, this is a good base as it will be easier to lighten those ends. The picture below is the during process. I used Bleach and 9% (30vol) to get it to a nice pale yellow colour. I also used some Moroccan Oil in the bleach to keep the elasticity of the hair the best it could be. 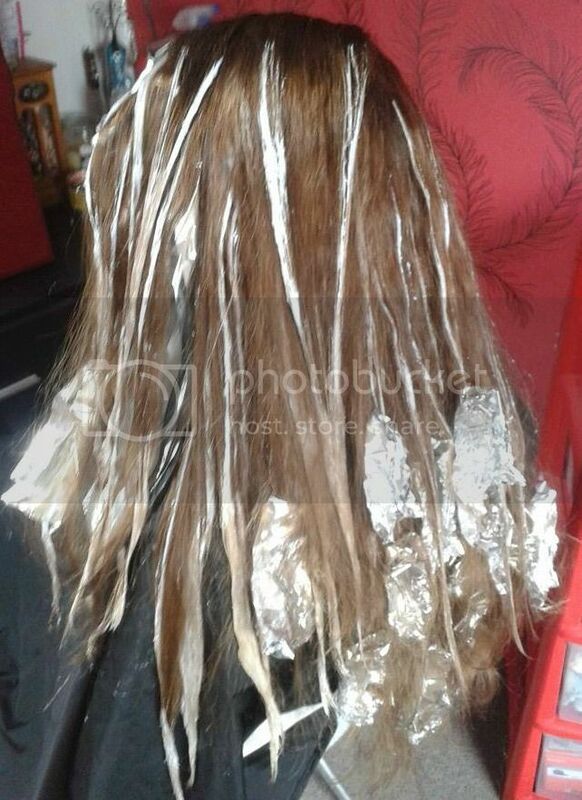 Fine strands of hair and then more of a block colour on the ends to create the lighter look. 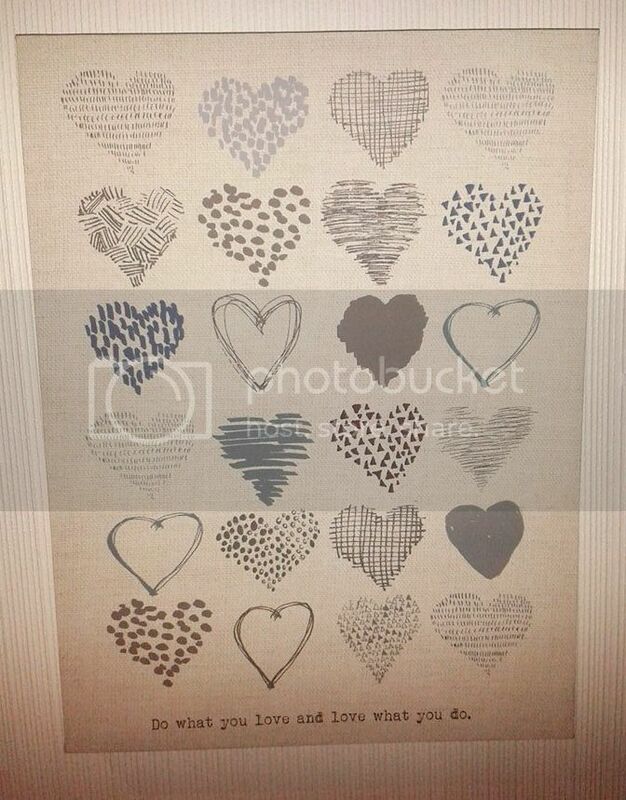 The pictures below are the finished product! The colour went surprisingly nice just from the bleach but I do like to finish ombres/balayage with a toner. I used Loreal Dialight 9.13 with 4% after shampooing the hair and left it on for 15 minutes. I rinsed, conditioned and did a curly blow dry and here we have it! 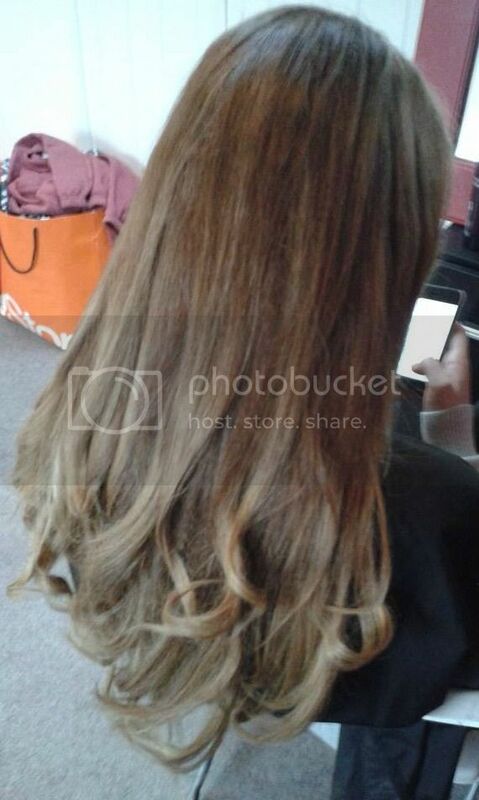 A gorgeous subtle ombre that has lifted the hair and given it a fresh,young look. I was so impressed with the outcome! Balayage is definitely a technique i'll be doing again. It's all about deep rich tones at the moment, and that's exactly what I did on my client today. She has had quite a lot of caramel highlights for the last few months and was ready for a change. As you may know if you repeatedly get highlights done, you can find that the ends of your hair get blonder and blonder and with this, more damaged. 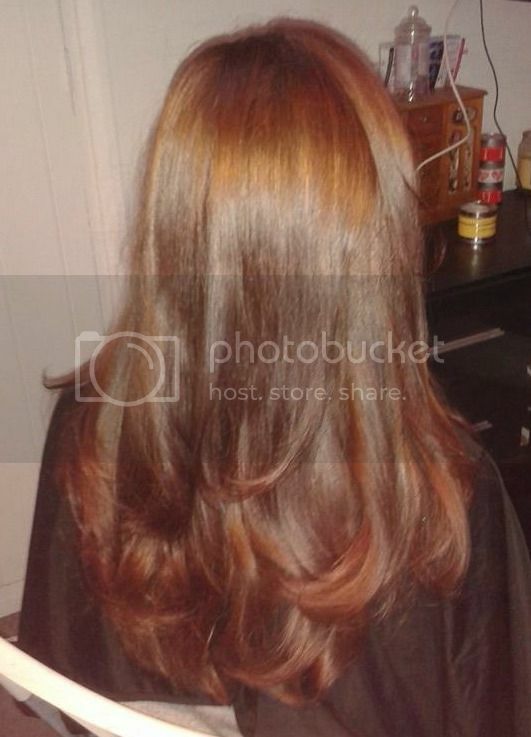 My client asked for a deeper brown colour that will add a lot of shine and warmth to her hair. 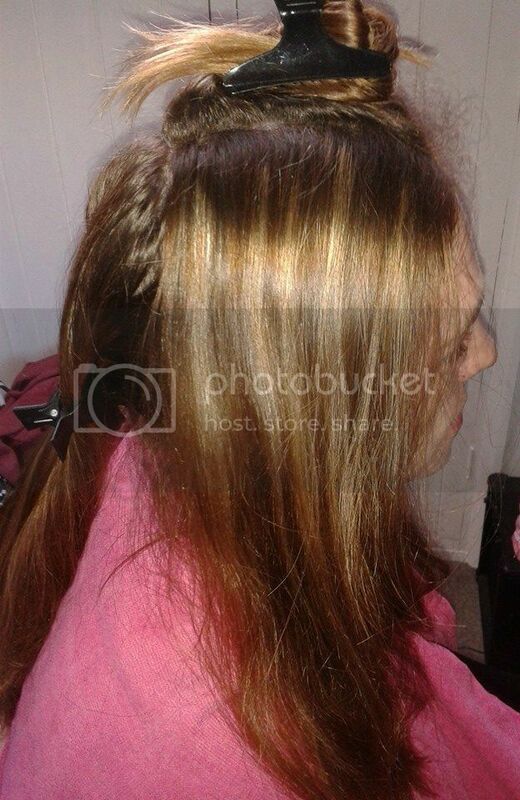 The blonde makes it appear as if it's quite frizzy and damaged even though it's in fact in good condition. The colours I used are the Kadus semi-permanent 6/75 on the roots and mid lengths and then I melted it into a 7/0 with a dash of 6/44 to give it a slight red tinge. The reason I used two colours is because i believe it gives it a really modern twist to have slight different tones in there rather than it been just a boring flat colour. I finished with a curly blow dry to show off the different colours. LOVE the result and so does my client. 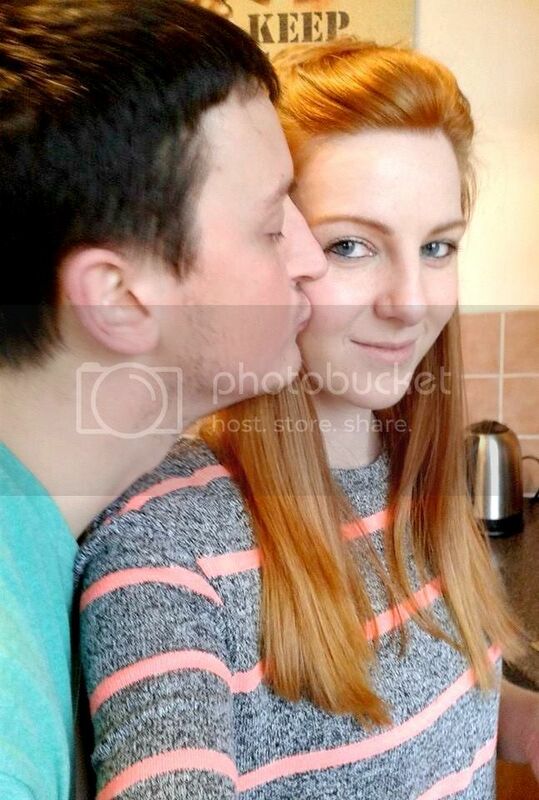 Now she has shiny, healthy looking hair.